As midwifery and woman-centered birth enter the mainstream, the midwives at the center of the discussion are beginning to have their day in the spotlight, lauded for their dedication and skill in stressful situations, allowing women to make empowered decisions about childbirth. But as that spotlight widens, tales of midwives behaving badly are also entering the conversation. An Arkansas woman whose birth was attended by Jill Duggar when she apprenticed under lay midwife Vanessa Giron is speaking out about both women, claiming that when it comes to Duggar’s midwifery skills, she “[doesn’t] think she’s qualified.” She might just be right about that. The woman, whose name is Tiffany Nance, alleges that when she gave birth to her daughter Jozzie in 2014, inaction on the part of Giron resulted in Jozzie being born with cerebral palsy and prevented Nance from receiving antibiotics for group B strep, a common bacteria that can be passed on to babies during vaginal birth, with sometimes serious or fatal consequences. Nance claims that she begged Duggar to call 911 during her complicated and painful labor but that Giron would not allow it, concluding that if Duggar’s only training consists of her apprenticeship with the midwife, then there’s no way she’s qualified to deliver babies. 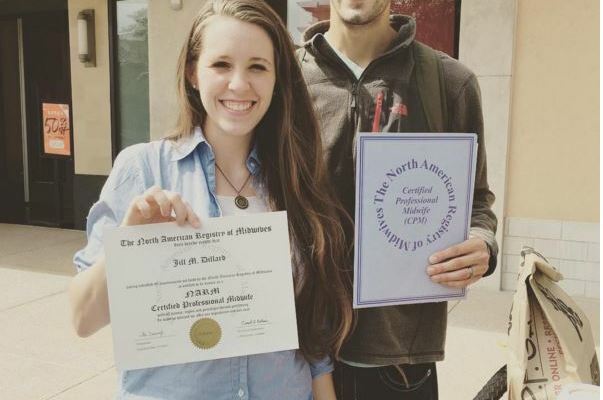 Both Duggar and Giron held certified professional midwife licenses in the state of Arkansas, and Duggar did apprentice under Giron as part of the state’s surprisingly few requirements for a CPM license. But there are a few things that are wrong with this picture. First, neither woman is listed now as a licensed midwife with the state of Arkansas. At least in Giron’s case, we know her license was revoked, and a post on Giron’s own Facebook page indicates that that’s because the state found her negligent in Jozzie’s birth. But even if both women were still listed in the state’s registry of midwives, you couldn’t blame anyone for giving their certifications a good, long side-eye. More: Motherhood in five words or less: These moms nail it! As more and more women seek out natural-focused childbirth and parenting alternatives, they seek out midwives and doulas to attend their births, but some people do not realize that there is a very big difference between a CPM — a lay midwife, like Giron and Duggar — and a CNM, or a certified nursing midwife. And there is a huge difference — one that every mom should know. CNMs are nurses. They have an undergraduate degree in nursing, and then if they’d like to focus on midwifery, they must be accepted into and attend a graduate program equivalent to a master’s degree that is specifically focused on midwifery or hold a master’s in nursing before passing a board-certified exam. CPMs are laypeople. They are required to have a GED and CPR certification, to test negative for tuberculosis and to attend at least 20 births under a licensed CPM, alongside passing a number of prenatal physical examinations. They also have to take an exam, but it is not board certified. Given the amount of rigorous educational requirements that the former must meet, it’s no surprise that Duggar, who comes from a family where higher education for girls is not considered worthwhile, would opt for the latter route instead. There’s no gentle way to say this: It’s just a quicker, easier route to midwifery. But quicker and easier likely means diddly to women like Nance, who are rightfully angry when they feel they got swindled with a bait and switch. Jill Duggar is not to blame for Nance’s daughter’s complications, but had she been in training for her CNM licensure, she would certainly have been equipped to see the medical ramifications of not calling 911 when Nance asked her to. Duggar’s made no secret of her decision to not practice midwifery while she “has little ones at home,” which, if family history is any indication, means she won’t be looking into practicing again for decades to come. Giron, on the other hand, while unable to continue being a midwife in Arkansas, appears to be back in business in Oklahoma.